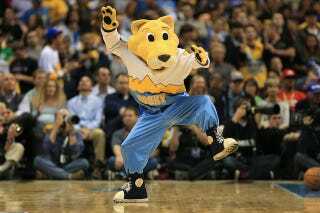 The Denver Nuggets mascot, a very acrobatic mountain lion named Rocky, is in trouble with his bosses after making an unsanctioned appearance at a Republican rally in Colorado yesterday. Wincott said the KSE management team met Tuesday "with the actor who plays Rocky to figure out exactly how it happened and what transpired and get to the bottom of how all this occurred." Wincott said the matter was being handled "internally" but the organization is setting "new protocol for anyone who wears a mascot uniform for a Kroenke sports team." The rally Rocky attended was hosted by Mitt Romney, in support of Bob Beauprez, who is running for governor against incumbent Democrat John Hickenlooper. I really hope this means that Mitt Romney had to interact with a giant, mute mountain lion at some point during the evening. Given what we know about ol' Mitt, there's no chance that meeting wasn't one of the most awkward moments in history. No matter Rocky's politics, we're just glad to see that he is still alive and kicking, because we were pretty sure he died that one time.